If you want to be a responsible consumer, you cannot simply think that the food you eat starts its life on the supermarket shelves. A recent survey found that over half of Britain’s less than ten year olds did not know that milk came from a cow, or that sheep produced lamb. They also did not know that chips came from potatoes, which grew in the ground. There is a staggering amount of ignorance in the UK regarding where our food comes from – not only how it grows but how it is produced. Celebrity chefs have tried to bring the subject of food provenance into the public conscious by badgering the government and having TV series with lucrative book publishing tie-ins. However, if you go to Italy or France, you will find that educating our children as to where food comes from and the impact it has, starts at the family dinner table. Now, we must not be too judgemental or say that everything is the parents’ responsibility, but next time you are in the supermarket with your children, or cooking dinner at home, try to talk through what you are cooking and explain a bit about where it comes from. If you buy a chicken, for example, it is too easy to think that you are just making a simple decision, buying whatever chicken is one special offer at the supermarket, in order to make your family a tasty, healthy meal. In times of recession, this is perhaps the most important decision, but if you have a little extra time and/or money, take a moment to think about what you are buying. The rows of packaged chickens in the supermarkets will have had very different lives. The ‘two for four pounds’ chickens will probably have started life somewhere in Eastern Europe, with little more than a shoe box size patch for each bird. They will have been pumped full of antibiotics because they cannot roam free and get fresh air to keep them healthy. At a very young age they will probably have been transported live to another country, often on the road for days with no water. They will then be slaughtered and processed, then transported for packaging then finally being transported to your supermarket. So they may sit on the supermarket shelves looking plump and juicy, but this is more to do with the water and chemicals they are often pumped full of, rather than illustrative of the happy, outdoor life they have lead. 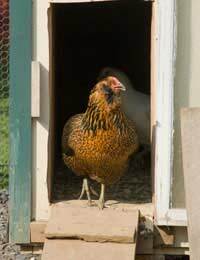 However, take a farm-reared chicken. It doesn’t have to be organic as this makes it more expensive, but at least chose a free-range bird. People of the baby-boomer generation and before will say that having a roast chicken was a treat, a delicious meal that they looked forward to perhaps once or twice a month. Now we expect to throw packets of chicken breasts on two for one in our trolley several times a week. If we learn to value the meat that we eat and the live that it has lead, we can enjoy delicious meat less often, safe in the knowledge that we are not contributing to inhumane practices that, just because we can’t see them, doesn’t mean they’re not happening.